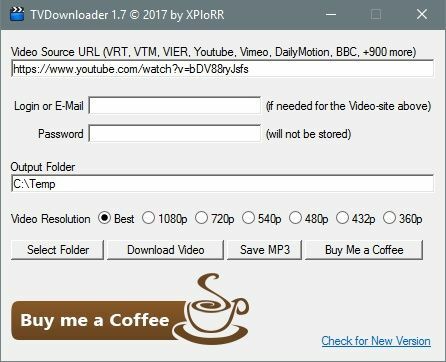 TVDownloader downloads video and audio streams from Youtube, Vimeo, DailyMotion, Twitch, Veoh, BBC, +900 more sites to a videofile or mp3file. Very easy to use, just copy the video url, set the output folder, select the video resolution option: Best, 1080p, 720p, 480p, 360p and download! Based on youtube-dl and ffmpeg. Version 1.12 is clean and easy to use. Downloads from over 900 websites.